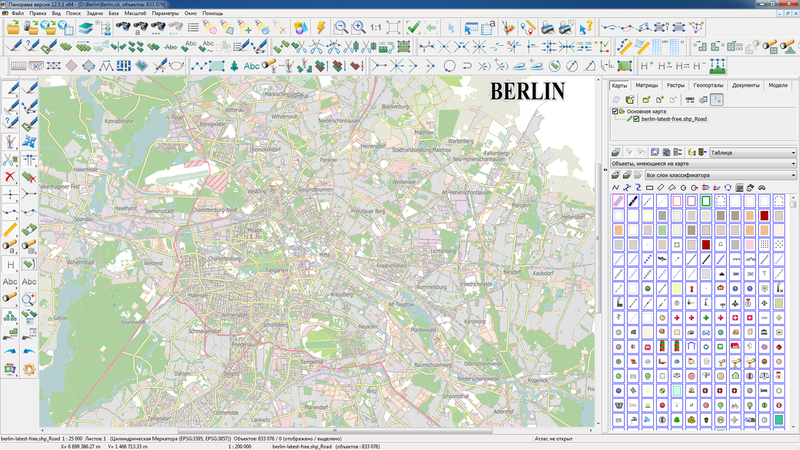 In KB "Panorama" the Complex of automated quality control and correction of maps of version 6.6 is developed for platform x64. In the new version of the program the procedure of quality control is accelerated and the list of formats for generating report documents is expanded. The output of reports into text documents containing markup in HTML is implemented. 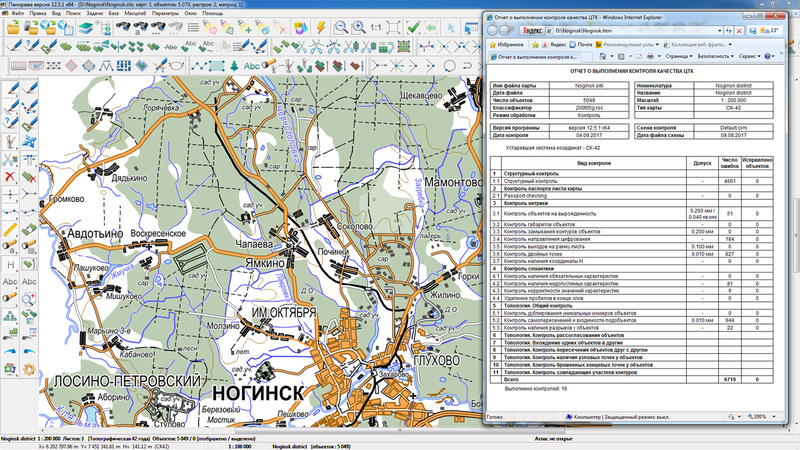 The templates of reports of the results of quality control and correction of maps in HTML format are developed. The received reports can be opened with the help of various office programs, text editors and Web-browsers. 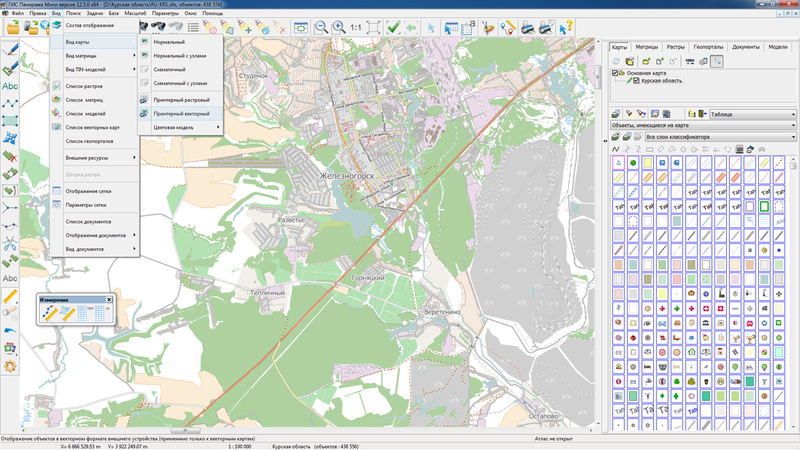 The complex of automated quality control and correction of digital maps is intended to obtain a single digital map by the original digital maps in the SXF format created by different classifiers. 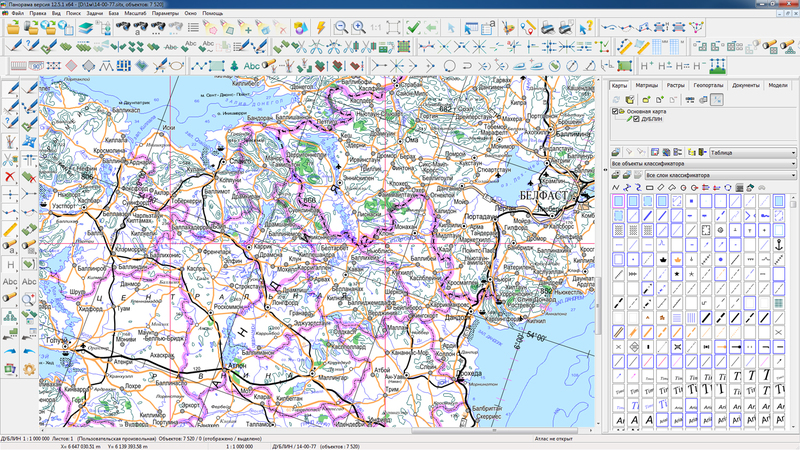 The complex of the automated quality assurance and correction of digital maps consists of a set of programs: code conversion and quality assurance DTM with editing, control of the coordination of adjacent sheets DTM, association of adjacent sheets DTM, the conformity analysis object structure of maps and classifiers. 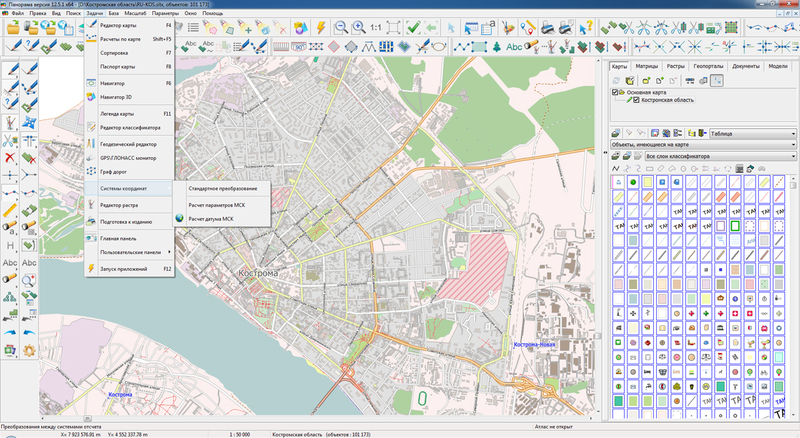 In KB "Panorama" the GIS "Operator" is developed for power structures of version 12.5.2 for the platform x64. 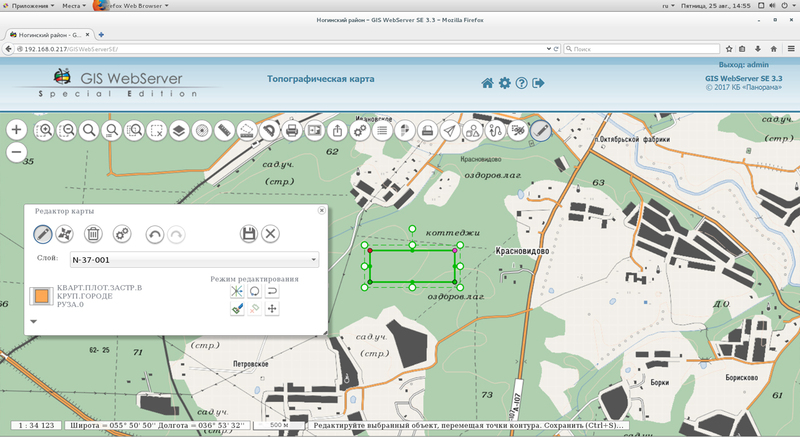 In the new version, the task of connecting geoportals has been refined. Support of a new geoportal is added for realisation of monitoring the movement of aircraft. 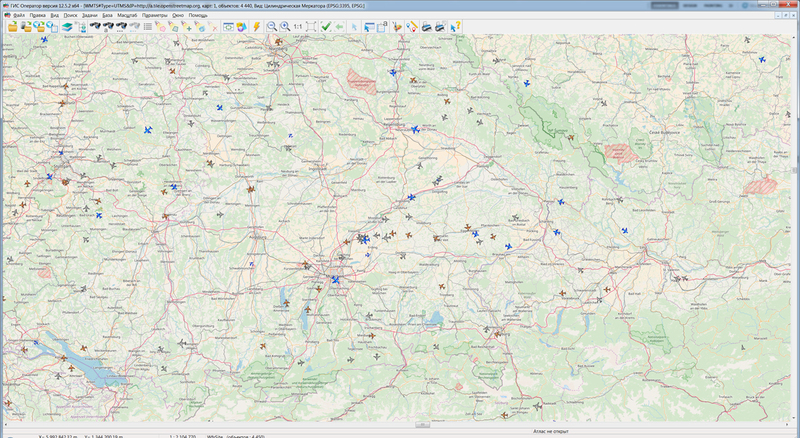 Geoportal "Monitoring the Air Traffic" uses the public web service Flightradar24, which allows real-time monitoring of the situation of aircrafts, being in air. Tracking with the help of service the position of the aircraft is possible only if it is equipped with a transponder of ADS-B type and that is switched on. An aircraft equipped with an ADS-B transponder, during the entire flight, approximately every second generates and sends into an air a broadcast, open radio message, which contains the actual data at the time of departure-its exact coordinates, current speed, altitude and other information. The service uses ADS-B receivers installed around the world that receive information from aircraft and send it to the Flightradar24 server. 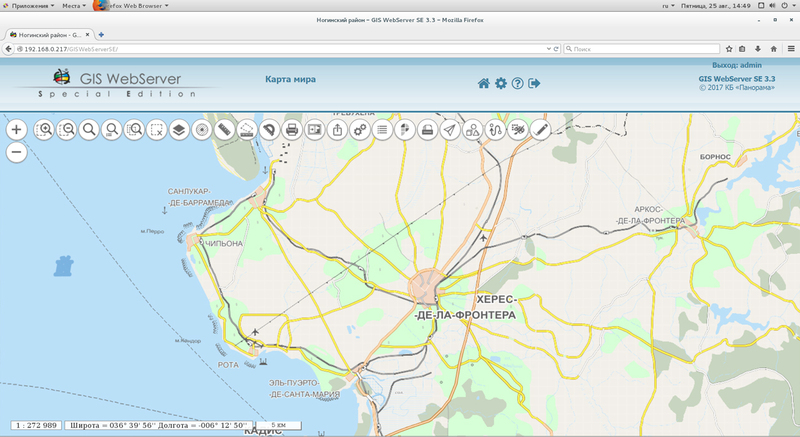 To view the current position of the aircraft in the GIS "Operator" it is necessary to connect a geoportal "Monitoring the Air Traffic", to set the period of updating the image of the program window for 5 seconds, and to turn on the property "Update of WMS layers". In the process of monitoring, detailed information about the selected flight is available: airport of departure and arrival, travel time, model, speed, direction, altitude and other parameters. 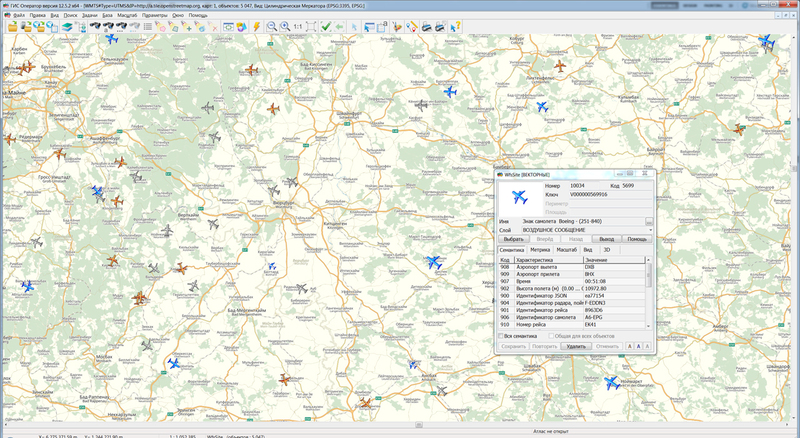 Aircraft on the map are displayed with various conventional symbols from the classifier service.rsc depending on their model, dimensions, seating capacity. In total into the classifier service.rsc 16 new conventional symbols for a designation of aircraft were added. Among them, such lines of aircraft as SuperJet, TU, IL, Airbus, Boeing, Bombardier, Dassault aviation and others. 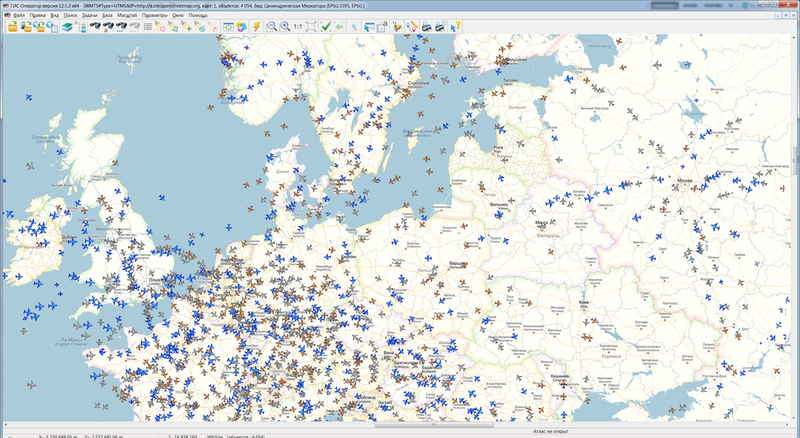 The user can change the image of conventional symbols and expand the list of available aircraft models in the "Classifier Editor". The task "Loading data from the COLLADA format (* .dae)" has been refined to edit the 3D view of the object in the classifier editor. A new format has been developed for storing data in the SQLite database in the form of tiles that are convenient for displaying in web applications. Processing of nested nodes with links is added. New possibilities are added for processing rasters that open directly without conversion to RSW (when open, the mode "Do not copy the source image to the RSW file" is selected). 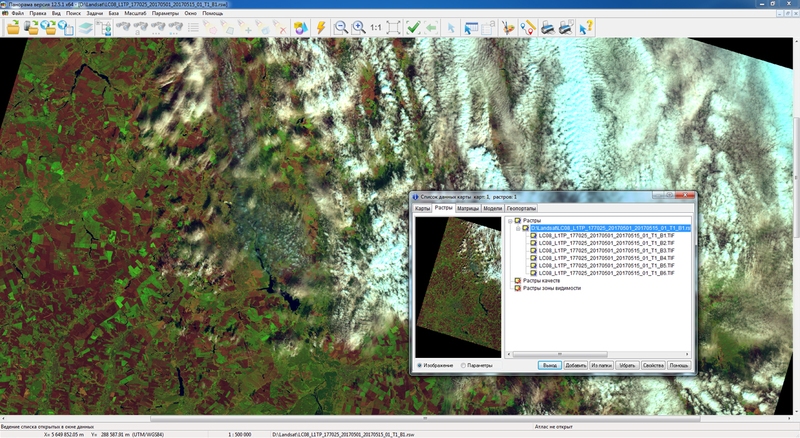 There is added joint opening and display of Landsat, Kompsat and GeoEye images supplied as a set of single-channel TIF rasters. Single-channel TIF rasters are interpreted as different channels of the same image. The restriction on the maximum size of survey images of 4 GB is removed, which allows processing images of any size. 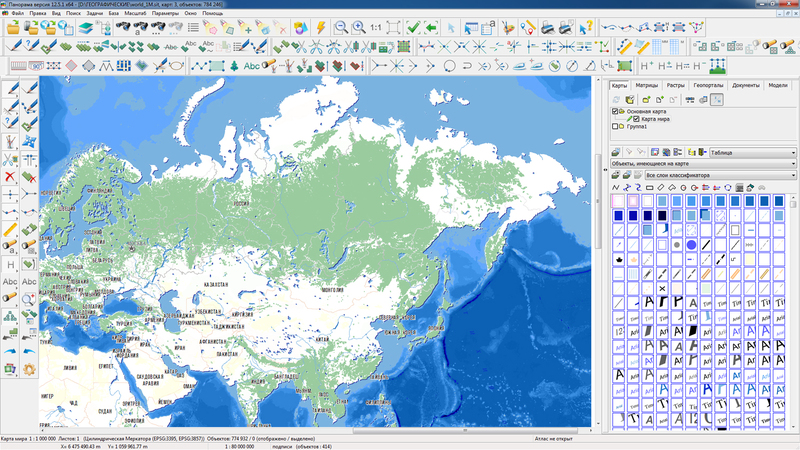 The GDAL library has been updated to version 2.2.0, in which new formats of processed rasters have been added. 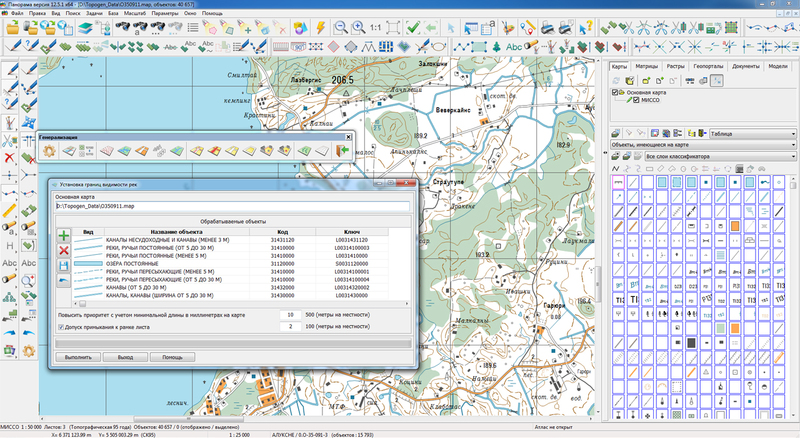 The dialog of the "Data List of map" and "Map Legend" task has been improved. 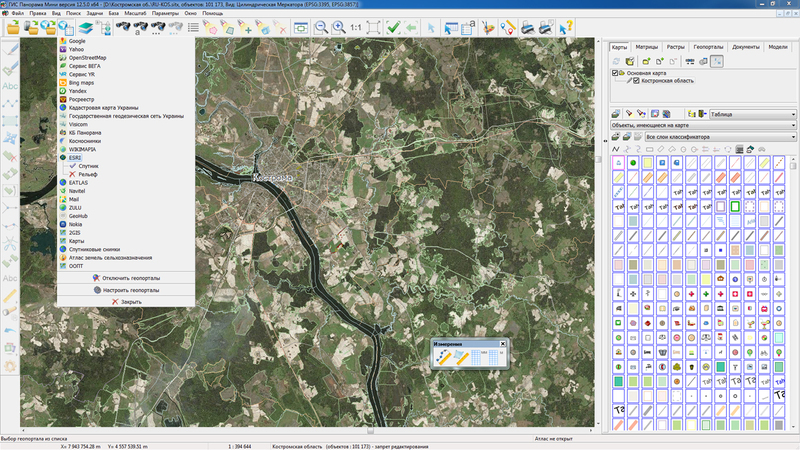 Multichannel Landsat, Kompsat and GeoEye images, supplied as a set of single-channel TIF rasters, are displayed in the list of rasters as a node containing a complete list of used TIF files. At requesting lengths of objects or segments having a length of more than 5 degrees in longitude, the orthodrome is automatically constructed, which ensures the calculation with the accuracy of class 1 triangulation. Accurate length calculations are performed if the "Precise square and length" property is set in the Options menu. 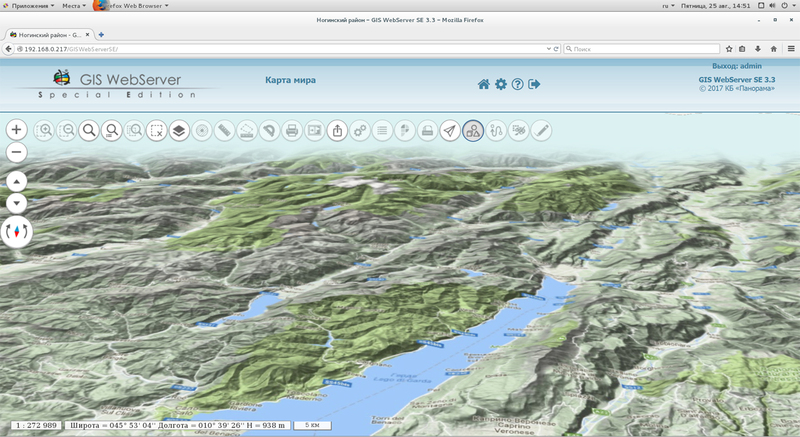 In KB "Panorama" the GIS WebService SE version 11.8.0 for CentOS OS is developed. In the new version, the administrator can assign a lifetime to each user or virtual folder separately. As a result, "in the fast access" there is the most necessary and relevant data, and by optimizing the data set stored in the RAM, the speed of the service is increasing. The functional of obtaining the calculated information is expanded. For creation of buffer zones there is implemented a request of their construction by the closed linear objects, and also by an arbitrary object, passed through the input file. The new request of obtaining the distance, azimuth and directional angle is added. Requests of transactions are improved, allowing to analyze the list of available for object of editing of semantic characteristics and to update only transferred for semantics change. 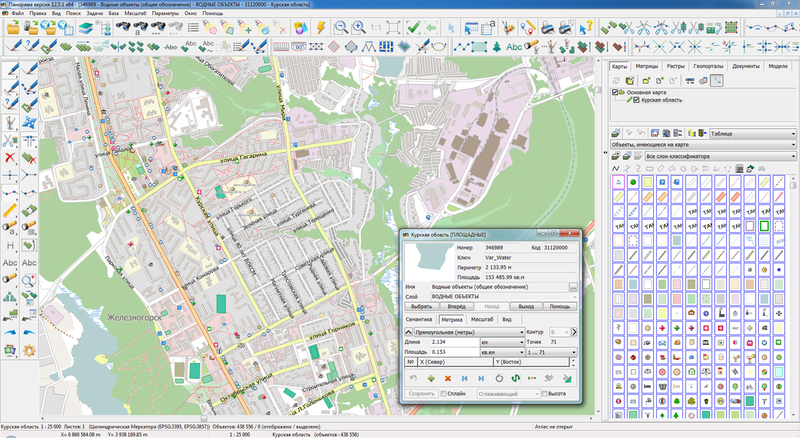 GIS WebService SE implements support for a single geoinformation space, providing the transmission and display of spatial data located on a spatial data server (GIS Server), according to international standards OGC WFS, WFS-T, WMS, WMTS, WCS. 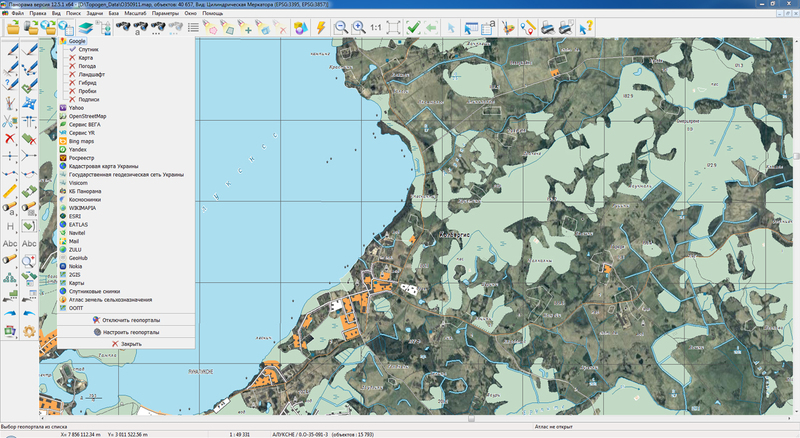 For preliminary selection of data to be placed on the GIS Server, and also for automated formation and updating of geo-covers, the Databank of digital maps and remote sensing data is used. 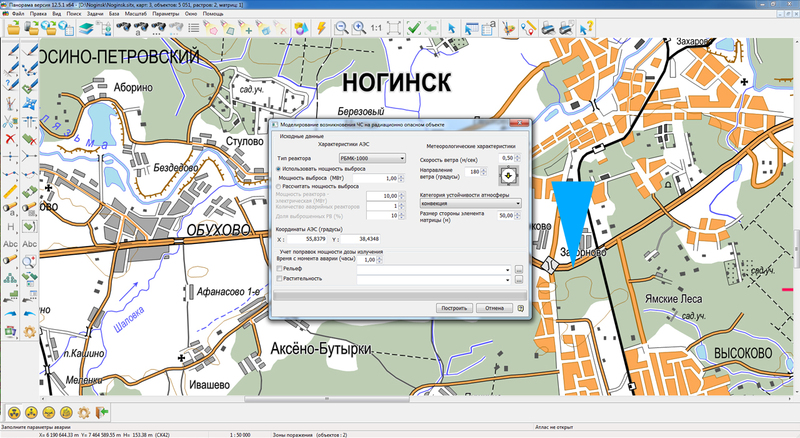 Requests implemented in the new version of the service allow you to select the conventional symbols used in the formation of geo-covers, and dynamically configure the composition of layers located on the GIS Server.